A stock promotion sent TRXC up by over 150%; these same promoters have been involved in multiple other disastrous stock promotions. TRXC is now preparing to issue equity via a dilutive stock sale even as insiders are preparing to cash out. TRXC ALF-X robot has already been approved in Europe for 5 years, but has seen virtually no sales. TRXC has been claiming that they are expanding their sales force in presentations, but LinkedIn and the company website show limited employees engaged in any sales capacity. Authors note: The purpose of this article is to highlight a compelling short opportunity in shares of TransEnterix. 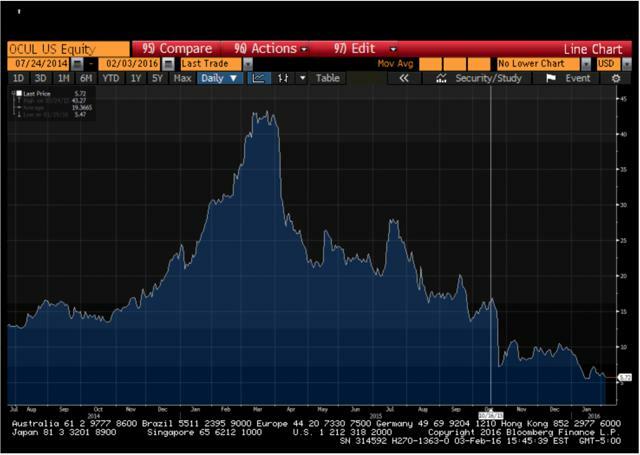 There is currently limited stock borrow available for shorting shares. However, there are liquid calls and puts available at $2.50 and $5.00 strikes. Those who are interested in shorting TransEnterix can either buy puts or sell calls and be effectively short in a way very similar to shorting common stock. 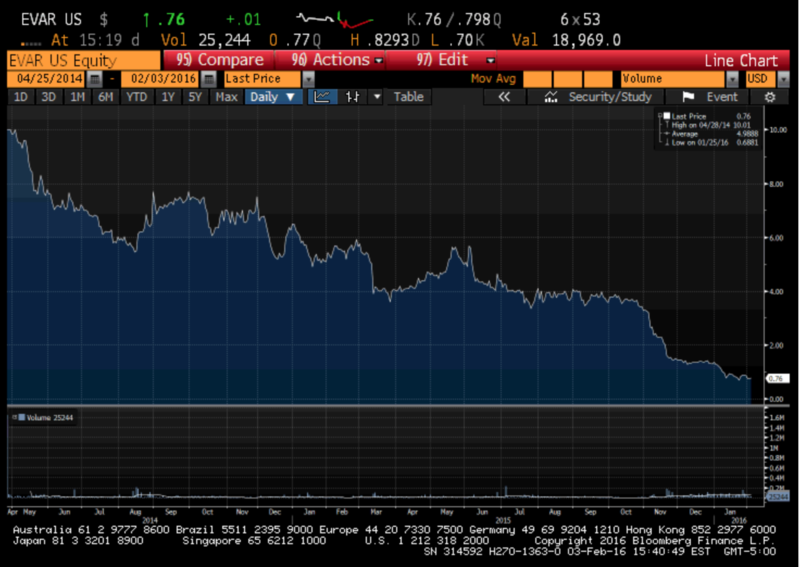 TransEnterix (NYSEMKT:TRXC) is a $400 million market cap medical device manufacturer. The company manufactures the SurgiBot and the ALF-X surgical robot, which has been approved and on the market for 5 years in Europe. However, the company still generates zero revenues because the product simply doesn’t sell. Management and board members have multiple ties to past similar promotions which have imploded. Shares of TransEnterix have risen by more than 150% in recent weeks due to a promotion from “Small Cap IR”, which has spread rumors that the company could be an attractive buyout target. Small Cap IR has been extremely effective in boosting the share prices of its clients just in time for the companies to complete equity offerings. 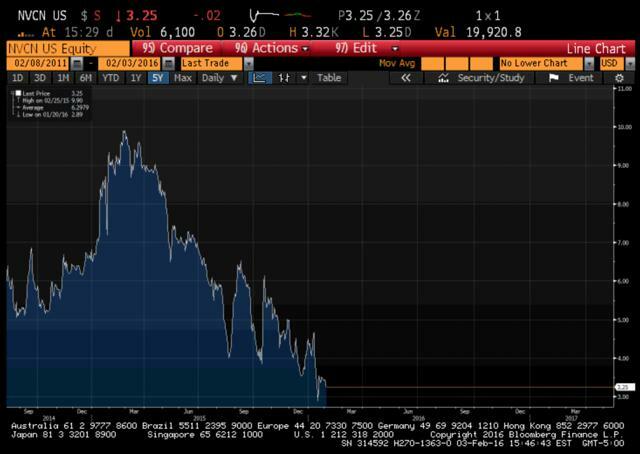 After the offering is completed, the share prices inevitably come crashing back down. 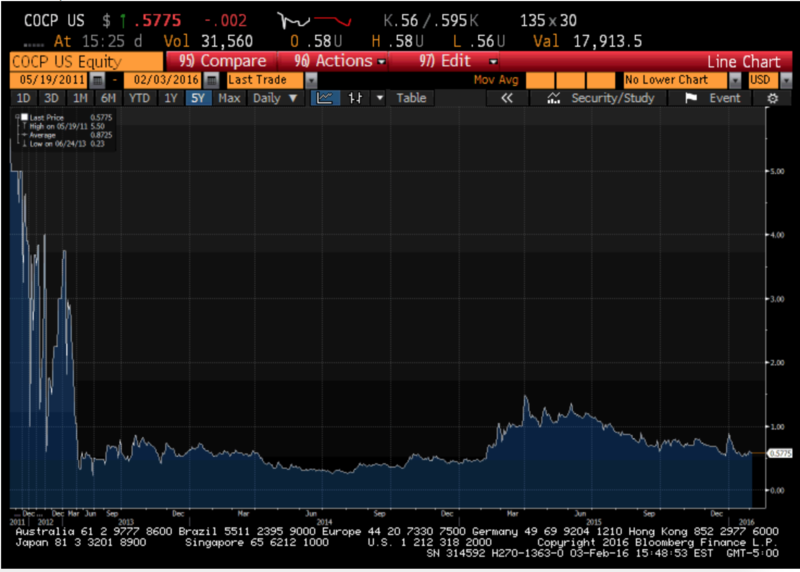 It should be seen as no coincidence that TransEnterix just filed an ATM registration to raise money via stock sales. This was done just in time for the stock promotion. Shortly after the price spiked, TransEnterix filed for the sale of 43 million shares for certain institutional investors. Over the past several years, I have exposed numerous companies whose share prices have been propped up only by paid stock promotion. There is always an underlying business, with some catalyst to sell investors on. The promoters take the basic underlying story and create a powerful new spin on it. Maybe there is a buyout in the works. A new FDA approval. A new strategic investor. The list of hypothetical catalysts for promoting a stock is nearly endless. But in general, this promotion only exists as a way for the company to sell shares into the market, using inflated stock prices and volumes to raise money at an artificial premium. Typically it is retail shareholders who are left holding the bag, having bought in on the basis of the new hype in the promotion. In the past year I have exposed DS Healthcare (NASDAQ:DSKX), Chanticleer Holdings (NASDAQ:HOTR), and Cellceutix (OTCPK:CTIX) as having been the subject of stock promotion. In each of these cases, the stock price had risen by more than 100% due to inappropriate and unsustainable stock promotion. I highlighted each of these examples as a compelling opportunity on the short side. Since my publications, CTIX has fallen almost 70%, HOTR has fallen 73%, and DSKX has fallen 60%. The promotion behind TransEnterix is virtually identical to what we saw in those cases above. As with the others, watch for shares of Transenterix to quickly fall by at least 60%. There is minimal underlying business and the recent share price strength is simply the result of unsustainable promotion. TRXC has been the subject of recent stock promotion. Those promoting the stock have numerous ties to other cases of stock promotion in which shares have plunged substantially, and many instances where the SEC halted the stock outright. Broad Street Alerts suggests that Johnson and Johnson would be interested in acquiring TRXC because sales in its medical device division have been flatlining, pointing to a collaboration with Google (Alphabet) as an indicator that J&J would acquire TRXC. Yet why would J&J, a $290 billion dollar company, acquire a pre-revenue company, when it is already in a partnership with Google? Furthermore, why would J&J seek to acquire a company whose product has been approved and on the market for 5 full years without generating any meaningful sales? Despite the nonsensical nature of the rumor, the speculation quickly spread and was repeated in 5 separate articles on the Motley Fool, helping to fuel the share price even higher. Broad Street Alerts is simply a landing page, that provides no information on their website other than a few vague lines about a trading community and there is no evidence of any written reports on their website. Broad Street Alerts is really just a front page for Small Cap IR, also known as Small Cap Street, a well known stock promotion firm that has promoted multiple disasters. According to WhoIs records, BroadStreetAlerts.com is registered by Shaun Zirnhelt. 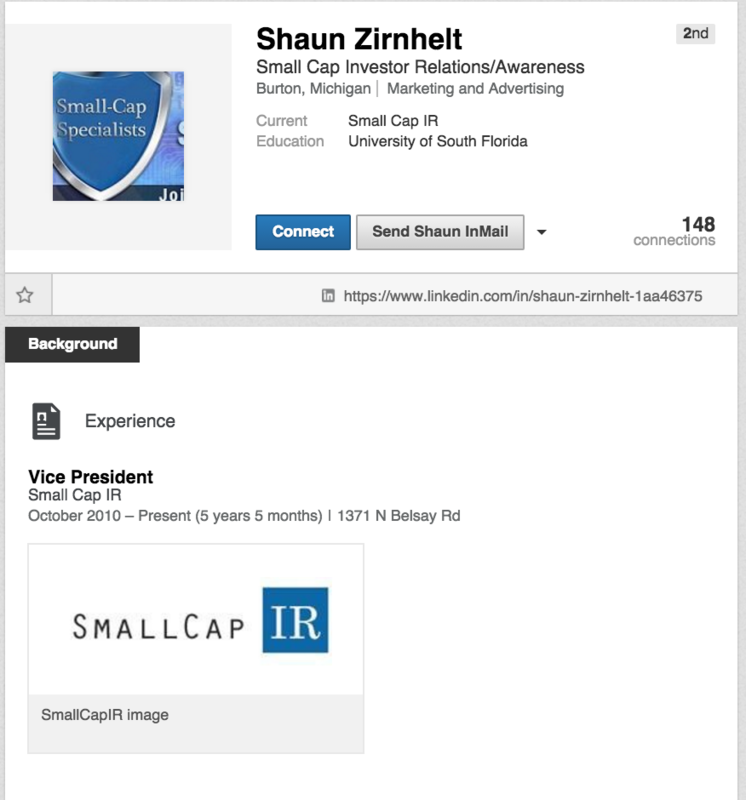 Shaun Zirnhelt is the Vice-President of Small Cap IR according to hisLinkedIn. According to this unrelated press release Paul Lipp is the President of SmallCapIR. His LinkedIn profile lists him as the owner of Small Cap Specialists LLC. According to Michigan LLC records Small Cap Specialists is registered by Shaun Zirnhelt, the same person who registered the SmallCapIR and Broad Street Alerts websites. SmallCap IR is a highly effective stock promotion firm, having successfully touted companies like Provectus (NYSEMKT:PVCT), ForceField Energy (NASDAQ:FNRG) and Actinium (NYSEMKT:ATNM), among others. Following a paid-for promotion by SmallCap IR, PVCT was quickly exposedby The Pump Stopper. The over inflated stock quickly cratered by more than 70%. The Pump Stopper highlighted the fact that PVCT had been promoted by Small Cap Street and Small Cap Specialists, which is another front for SmallCapIR. These various aliases are just fronts for promoters to hide their past failures. 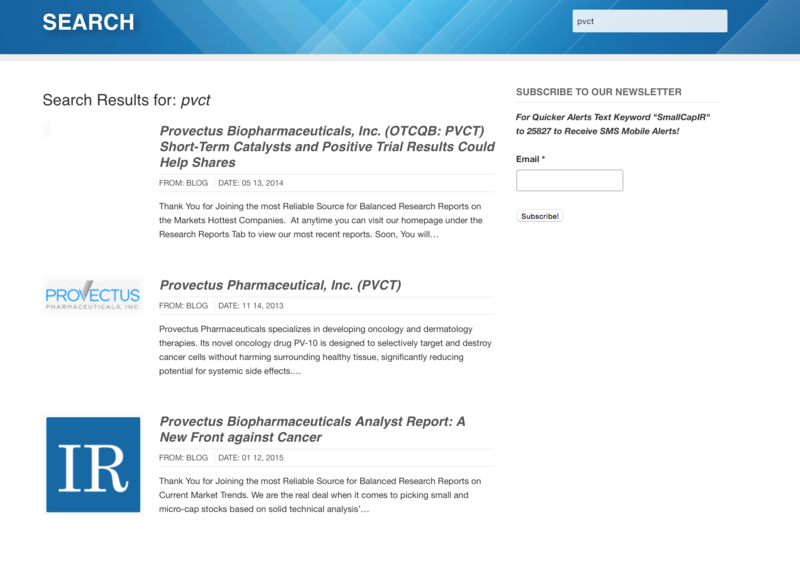 Despite the hype, Provectus now trades for just 40 cents. The most similar blueprint for a Small Cap IR promotion is Actinium Pharmaceuticals. Small Cap IR began promoting ATNM in October 2014 inthis report. Like TRXC, the stock had recently sold off from its highs but was bouncing. The report commented on ATNM’s strong pipeline and the recent submission of an Orphan Drug Application. Also like TRXC, Phil Frost was an investor in ATNM. But we can see clearly how the stock performed following the promotion. 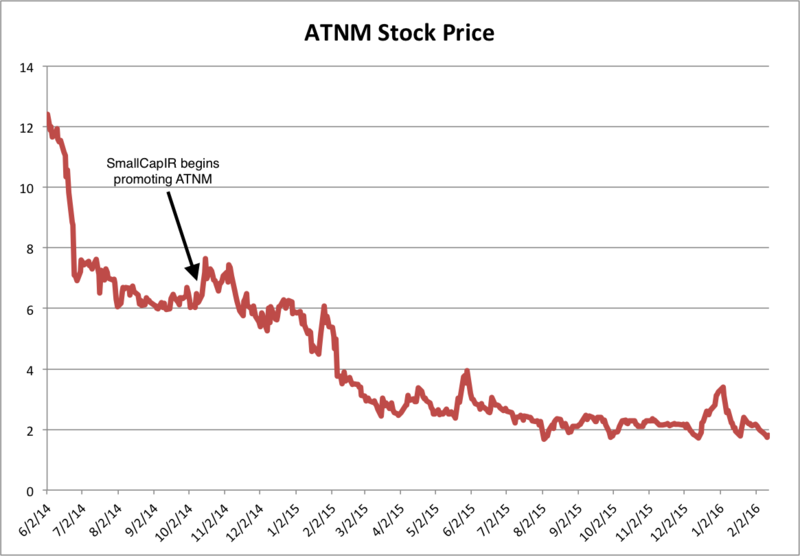 ATNM popped briefly after the promotion began. Shortly after the promotion began ATNM completed an equity offering, diluting shareholders that had bought into the promotion. This is an excellent example of the fact that many of these promotions exist only to prop up the stock temporarily in order to allow management to raise new money. 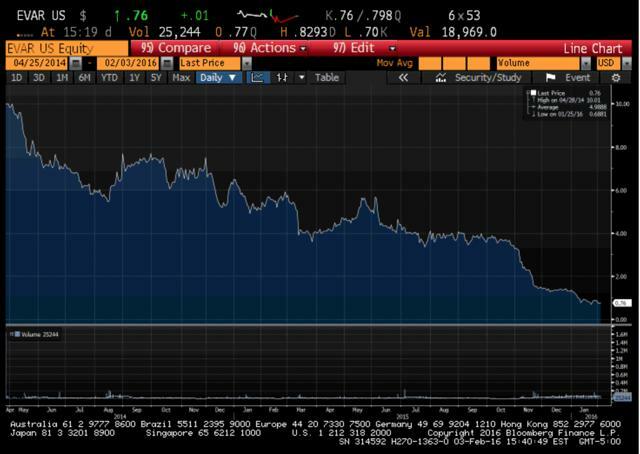 Forcefield Energy is another stock promotion which was run by SmallCap IR. Author Richard Pearson exposed ForceField Energy management’s ties to past frauds as well as the promotion. Days after the Pearson report, ForceField Energy executives were charged with manipulating the stock price while the CEO of that company was arrested when he was attempting to flee the country. 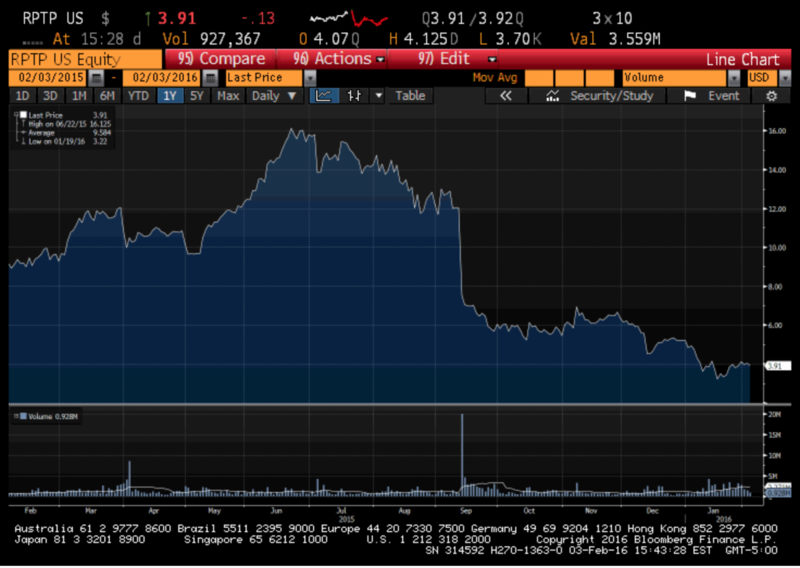 As for the stock, ForceField cratered by 99% from $7.50 to just 1 cent per share. The lesson to be learned here is that when a stock promotion is exposed, the implosion can come quickly and without further warning. These are just a few examples which highlight the fact that Small Cap IR gets paid to hype up companies which are either of very low quality or are outright frauds. There are numerous other examples which can be seen simply by viewing the past clients listed on Small Cap IR’s website. Management and board members of TRXC have a very checkered past. If TranEnterix was going to be a successful venture, then it would be the first successful venture that these stock operators have ever produced. Paul LaViolette owns 12% of TRXC’s outstanding shares and is on theBoard of Directors. While Mr. LaViolette did spend 15 years with Boston Scientific, eventually rising to the rank of COO, his post-Boston Scientific career has been spent being a number of private medical device companies. Along with David Milne, he is a managing partner of SV Life Sciences, a healthcare venture capital firm. David Milne owns 12% of outstanding shares and is on the Board of Directors of the company, and is a managing partner of SV Life Sciences.. Mr. Milne has been involved with several other public companies, and none have fared well. Here are some charts from the public companies that Mr. Milne has been involved in. Like TRXC, Lombard Medical is a medical device company. EVAR focuses on minimally invasive treatments for abdominal aortic aneurysms. Management touted a huge addressable market, but the company has lost $68 million over the past three years. In September 2015 Raptor Pharmaceutical plunged almost 40% one day after its main drug failed to meet its primary endpoint in its pediatric NASH study. 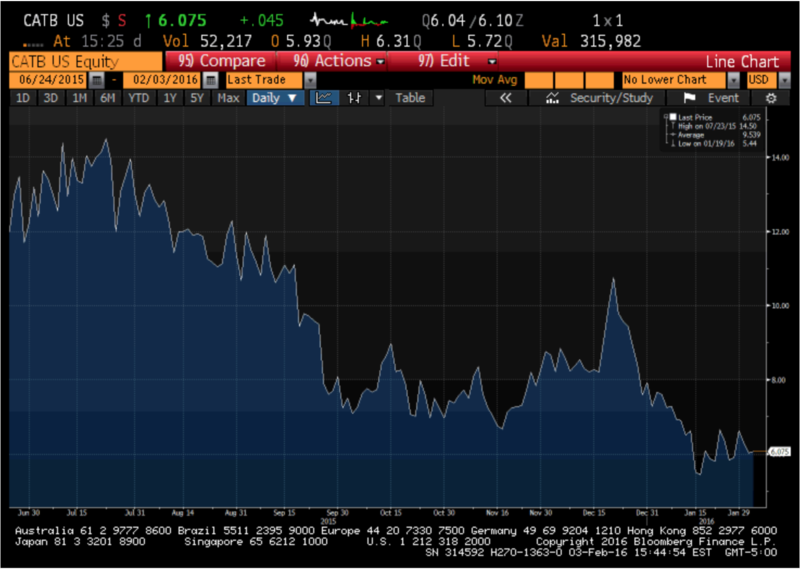 RPTP is down almost 75% from its peak. RPTP has burned through $140 million in the past three years. “Ocular Therapeutix ($OCUL) needed a clean sweep in its expansive Phase III program for a postoperative eye treatment in order to set itself up for a clear shot at an FDA approval. But it didn’t get it. Dr. Jane H Hsiao owns 7.8% of the outstanding shares and is a director of TRXC. She is also involved with Opko (NYSE:OPK) in several roles, including on the board of directors. There is less to say about the companies that she has been involved with, although all exhibit similar characteristics to TRXC. They are money losing companies that have all declined significantly. Dr. Hsiao was a director at Sorrento Therapeutics. SRNE is an oncology company that was developing drugs to aid with cancer pain. SRNE paidthe infamous RedChip for investor relations services in 2014. Here is the SRNE CEO being interviewed by RedChip founder David Gentry. 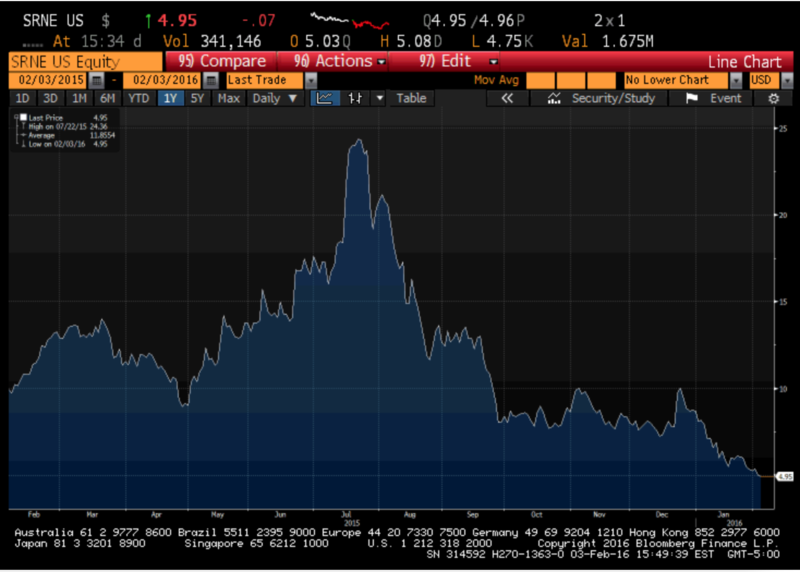 As you can see below, SRNE has fallen over 75% from it’s highs this past summer. In addition to the long list of failures and stocks that have cratered that those on the Board of Directors have been involved with, current CFO Joseph Slattery was the CFO of a similar company when it was fined $6 million by the DOJ for causing health care providers to submit false claims to Medicare. Joseph Slattery was the CFO of Baxano Surgical at this time. Baxano Surgery would later file for bankruptcy after Mr. Slattery left, wiping out shareholders. Like TRXC, Baxano Surgery was a reverse merger and a medical devices company. TRXC also has connections to Dr. Phillip Frost through Dr. Jane Hsiao. Much has been written about Dr. Frost’s involvement with penny stocks and numerous failures. The best and most in-depth of these reports wasLakewood Capital’s takedown of Opko Health . 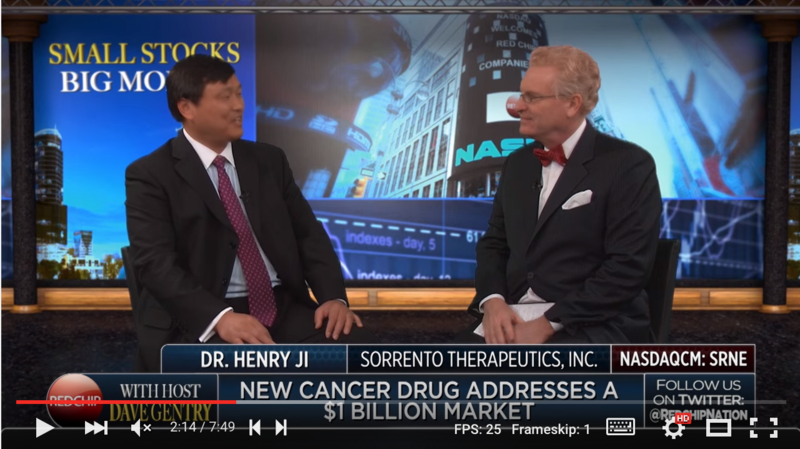 SafeStitch Medical was the precursor to TRXC and Jane Hsiao was the CEO of Non-Invasive Monitoring Systems, a penny stock. 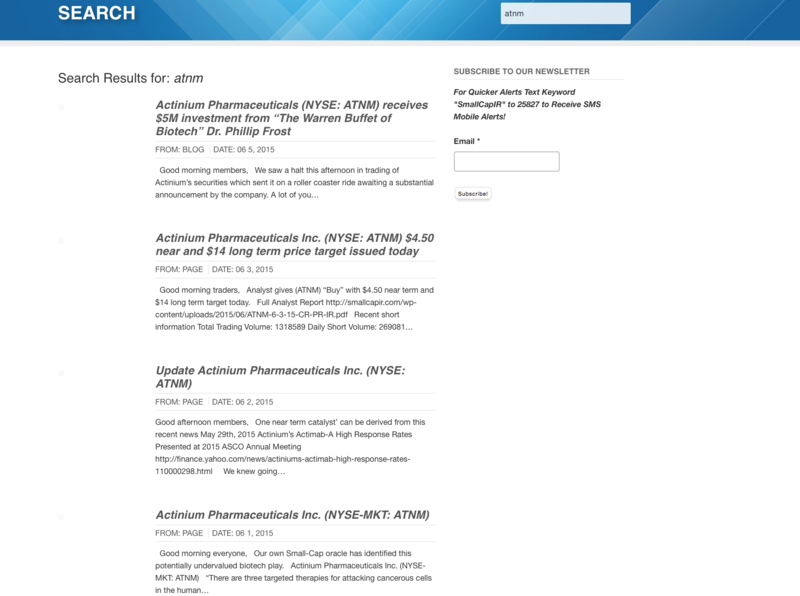 To go public, TRXC did a reverse merger with a company called SafeStitch. Dr. Jane Hsiao was the Chairwoman of SafeStitch at the time of the reverse merger, as highlighted above Dr. Hsiao is also involved with OPK. Additionally, up until August 2014 TRXC leased office space from Dr. Frost’s real estate company in Miami. Who will be selling the products? In a recent presentation at the JP Morgan Healthcare conference TRXC revealed its recent and future milestone plans in this slide. TRXC said that it expects sales of its ALF-X surgical robot system to commence in Q1 2016 and that it will begin its commercial team expansion. According to their milestones slide, TRXC should be in the midst of expanding their commercial sales team to prepare for the start of ALF-X sales. However, TRXC’s Career website only shows four current job openings. Most importantly, none of these openings are in sales. 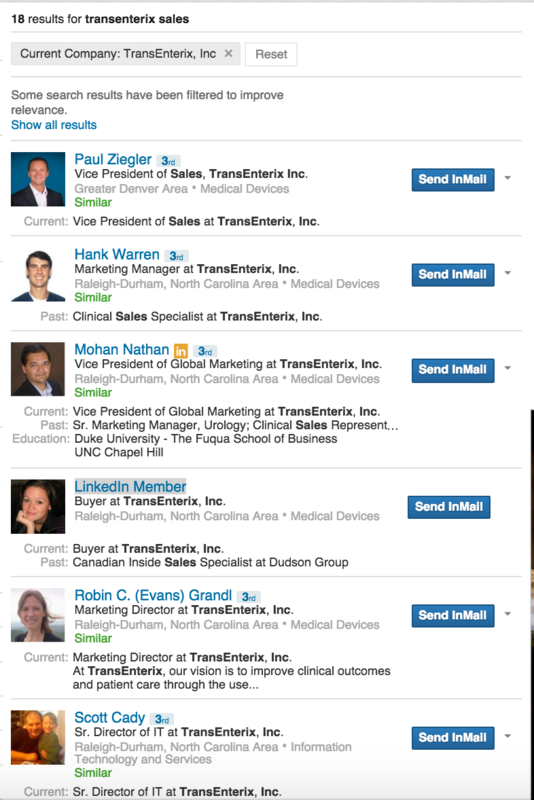 A search of LinkedIn also confirms that TRXC has not been building out it sales force. There are only of handful of TRXC employees that claim to work in marketing or sales on LinkedIn. 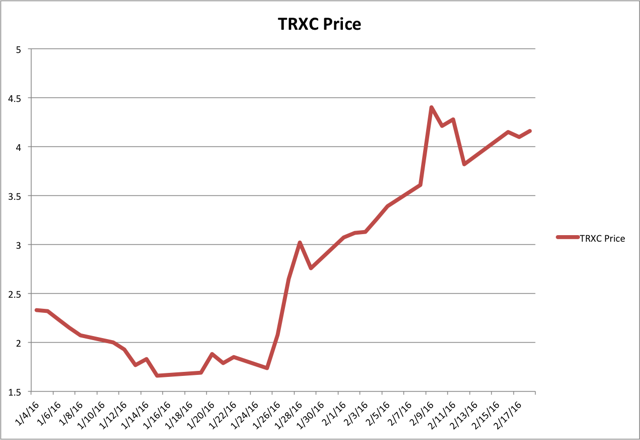 TRXC is going up against a much larger and better capitalized company in ISRG. Consider the comparative R&D spend for each company. Over the last couple of years TRXC has spent about 7 times more on R&D each of the last several years. TRXC promoters and bulls would like to have you believe that when the company receives 510k approval that sales will immediately begin and revenues will immediately ramp. This is simply not true. 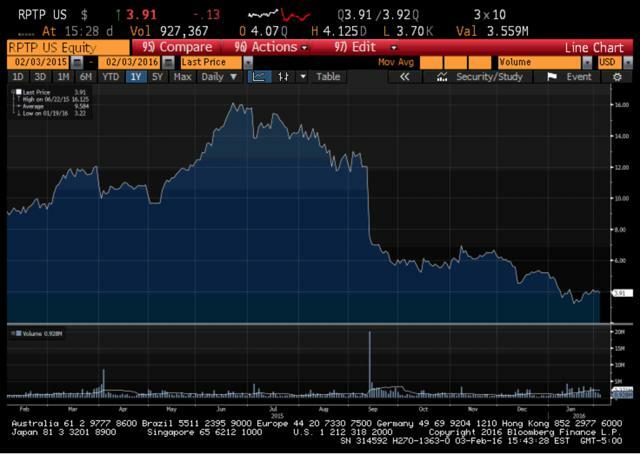 Look at the fate of TRXC’s precursor, SafeStitch Medical. In November 2009, SafeStitch Medical announced that they had received FDA clearance to sell their AMID Stapler. From this date until June 30th, 2013, SafeStitch only generated $52,000 in revenues. Clearly just because the FDA approves a medical product does not means sales will follow. More importantly, TRXC’s ALF-X has been approved for sale in the European Union since 2011, and it took until 2013 for the first device to be installed. Despite being approved for five years, the ALF-X surgical robot is still not generating meaningful revenue. The carve-out filings, for the ALF-X indicate that it generated zero dollars in revenue in 2013 and 2014, and only approximately $77,000 worth of revenue in 2015. In addition to the commercial failure of one of TRXC’s main product, TRXC has already had a surgical robot fail. TRXC developed the SPIDER Surgical System, you can view a demonstration of the SPIDER Surgical Devicehere. TRXC promoted the SPIDER Surgical Device in 2014 much the same way it is touting its SurgiBot and ALF-X systems. So what became of the SPIDER Surgical System? According to TRXC’s website, it is currently being phased out. It was a commercial failure. TRXC is nothing but a stock promotion being propped up by stock promotion. Those long TRXC should consider the track record of those who have funded TRXC, as well as the track record of management and the Board of Directors. One of TRXC’s key products in the past was a comerical failure, and TRXC simply began the development of a new product to have a new story to pitch to investors. The other of TRXC’s products is a commercial failure. Once the stock promotion ends, all longs will have to hold on to is the success of the products, which given the indication of sales in Europe, will de disappointing. 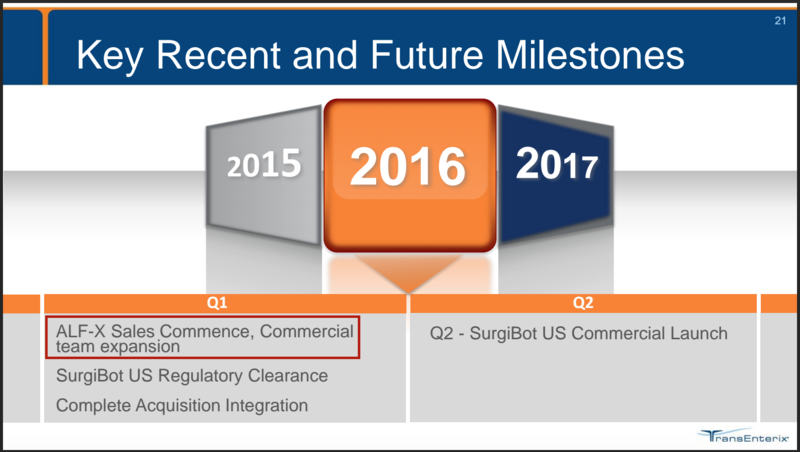 Once the SurgiBot receives 501(k) clearance, there will be no story to promote. Only sales, and with no one to sell either product sales will be disappointing.